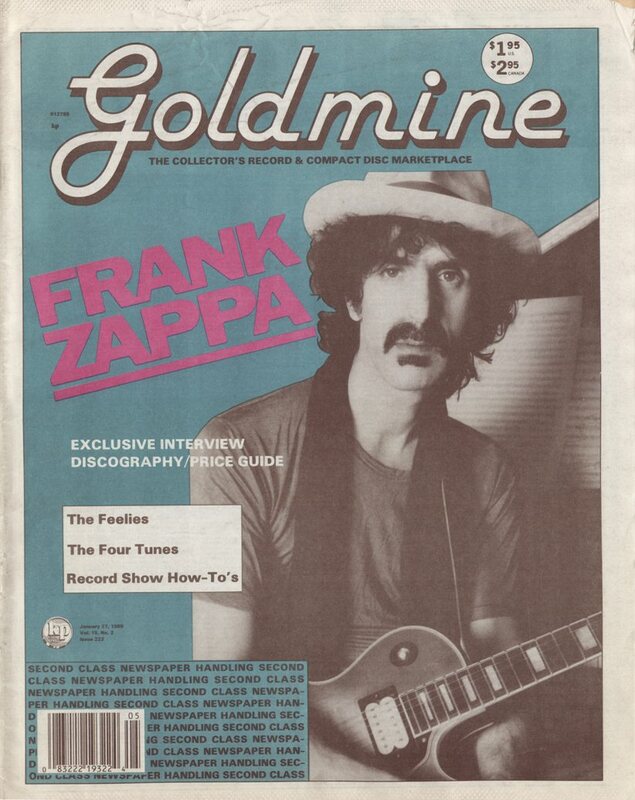 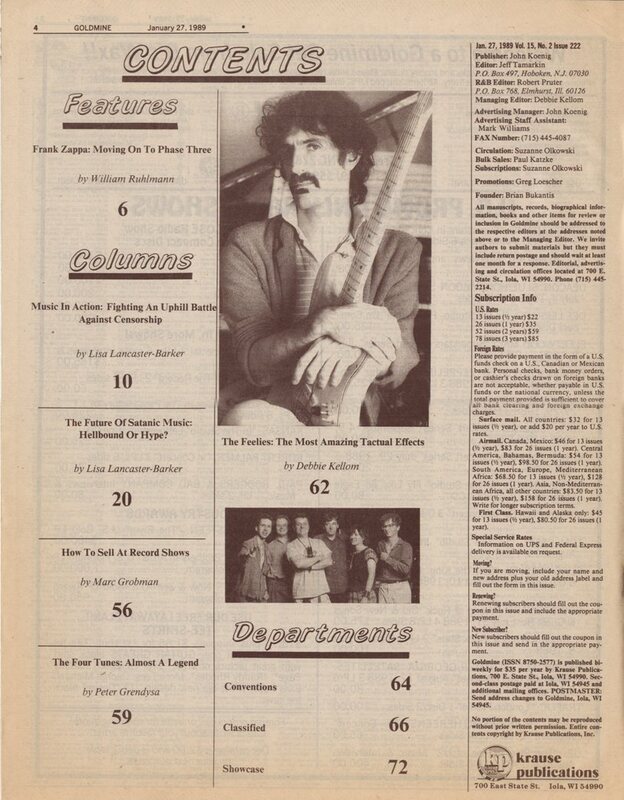 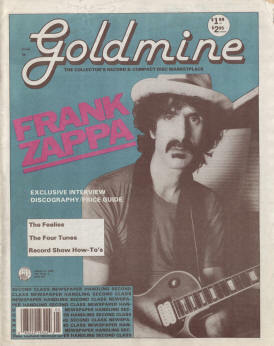 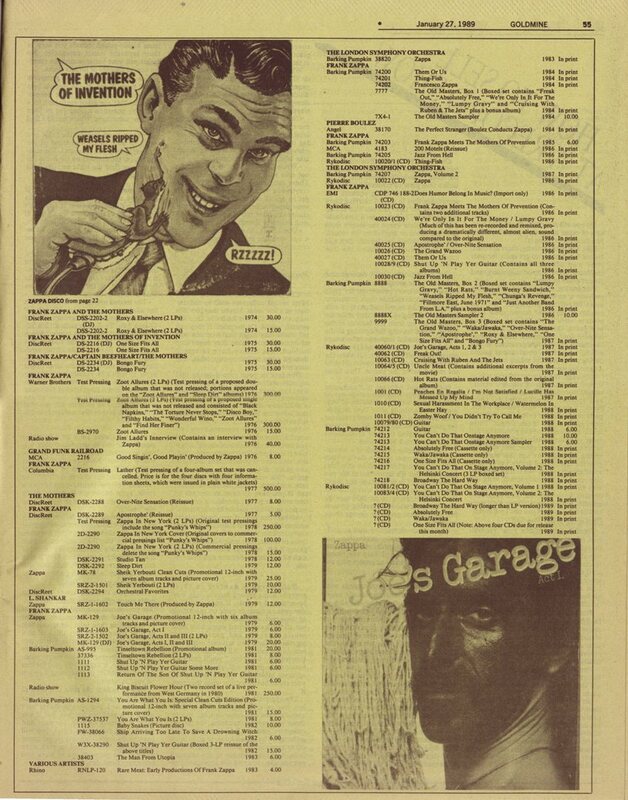 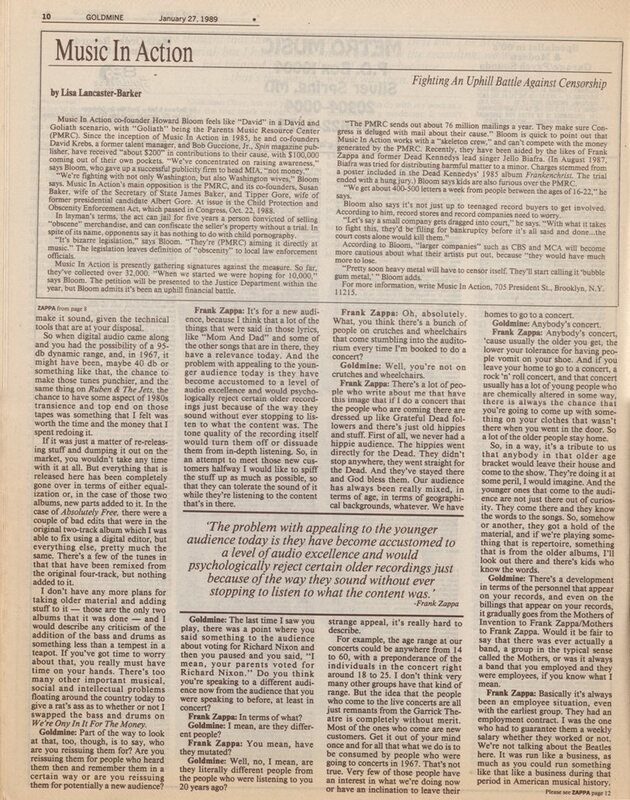 Goldmine was bought by Krause Publications in late 1983. 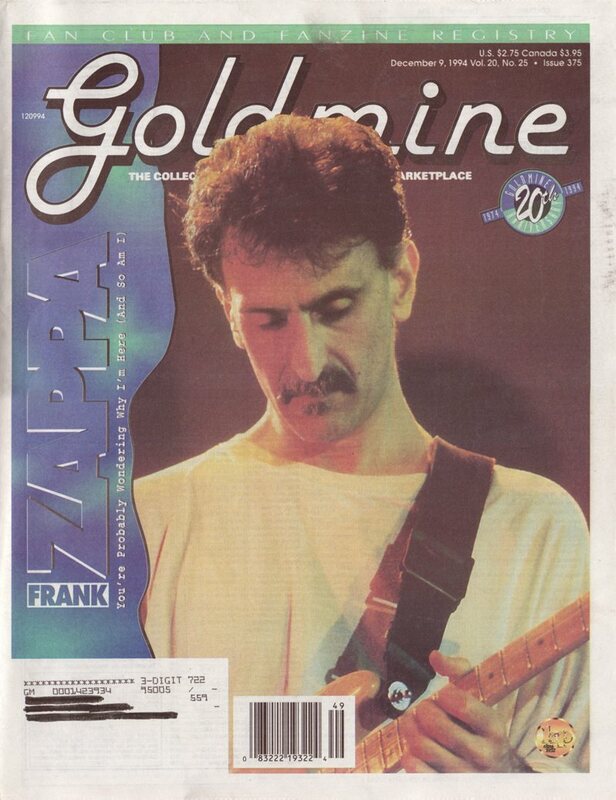 Goldmine's main competitor was DISCoveries, which was bought by Krause in 1999. Both magazines were issued in parallel until 2006. 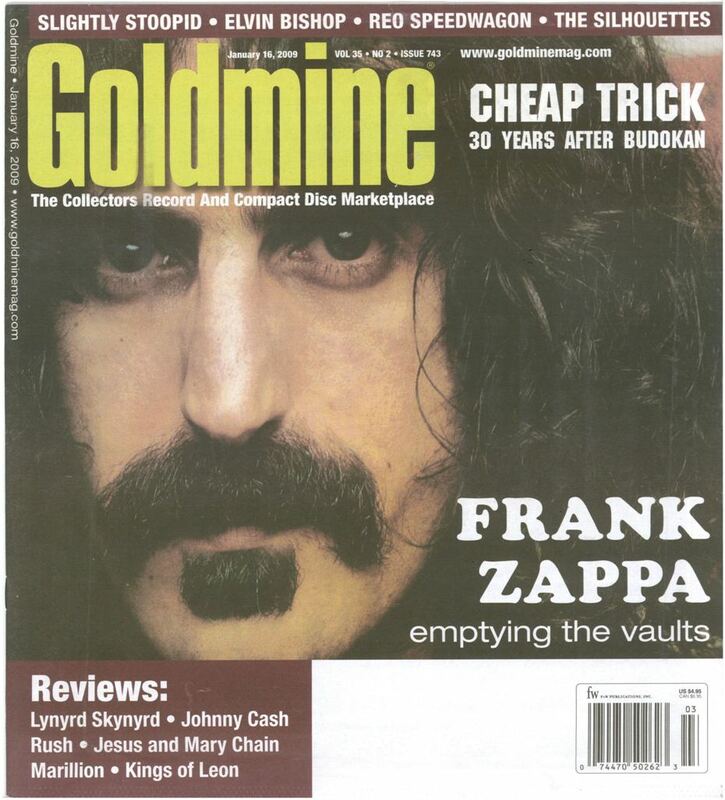 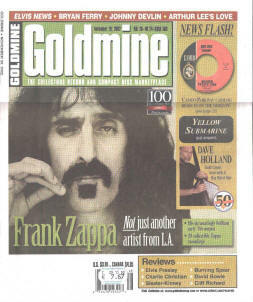 In the beginning of 2007 DISCoveries was merged into Goldmine. 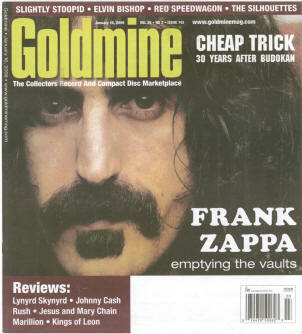 Goldmine: Let's jump ahead and go immediately up to talking about Verve. 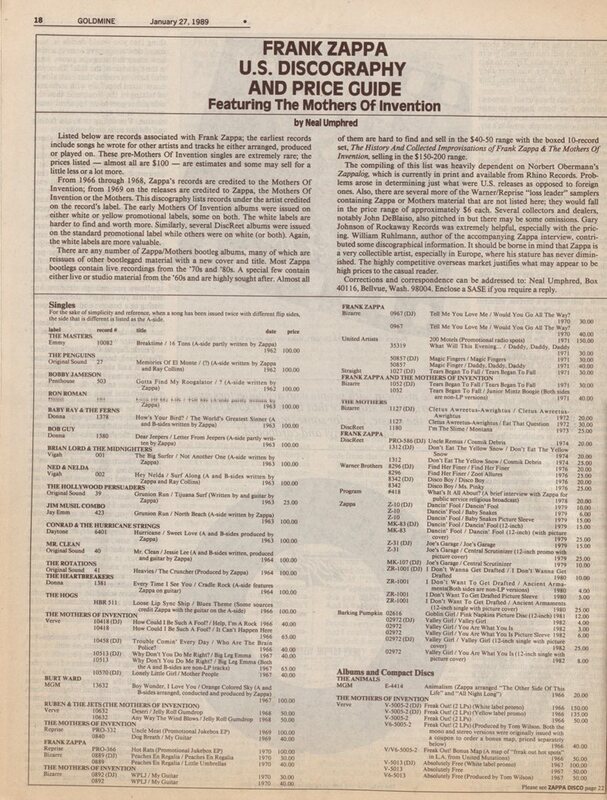 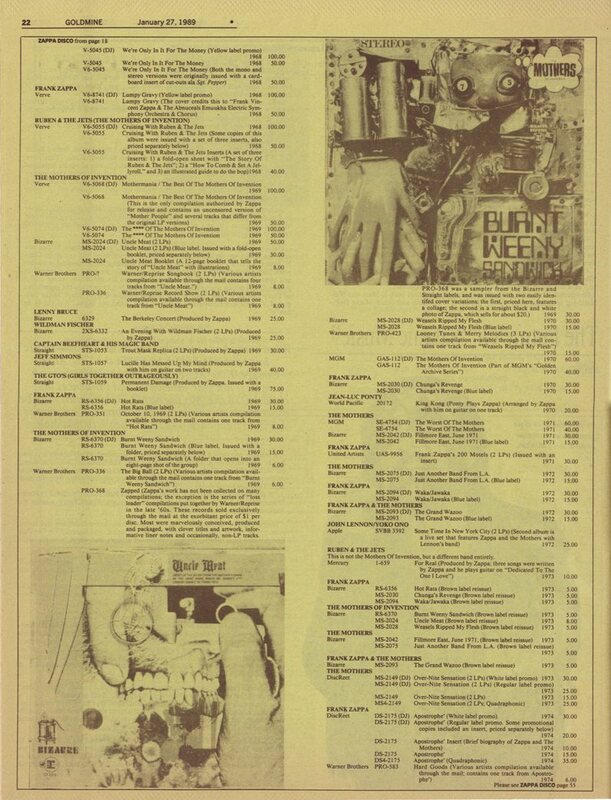 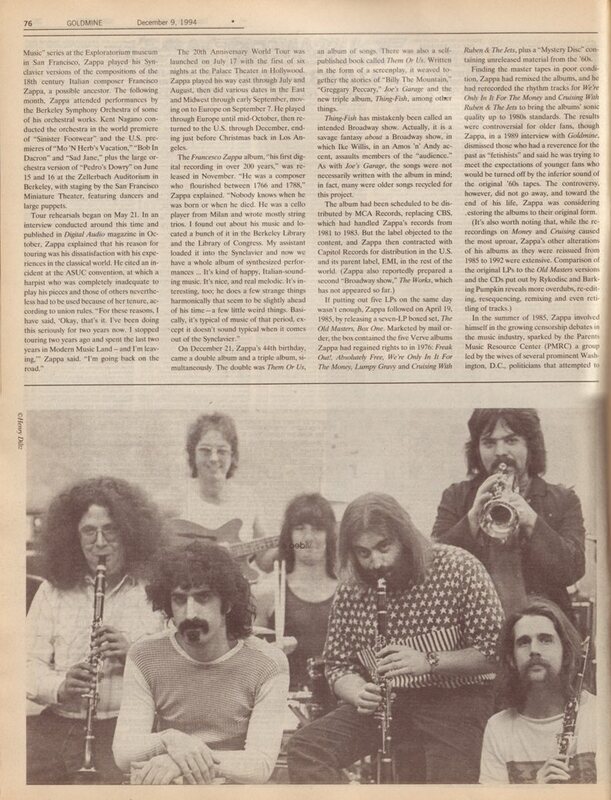 I suppose the unusual thing to me is that the Mothers of Invention would be signed to a label like Verve, which I associate with Norman Granz and jazz recordings, so I'm curious about how that happened. 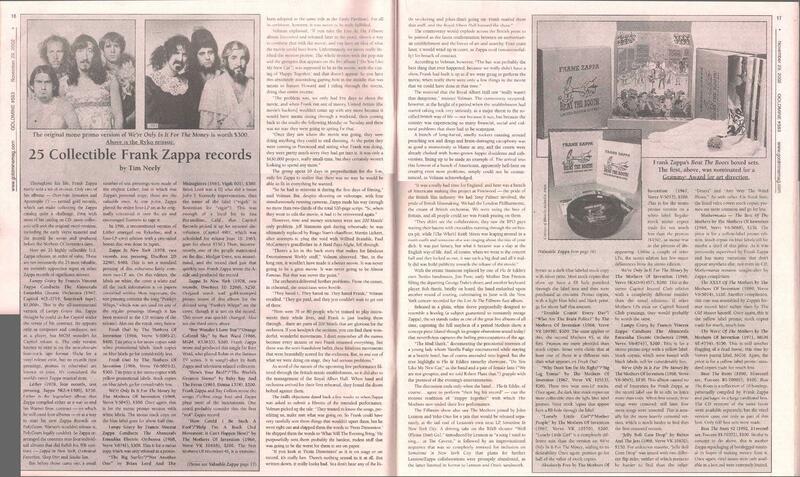 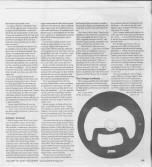 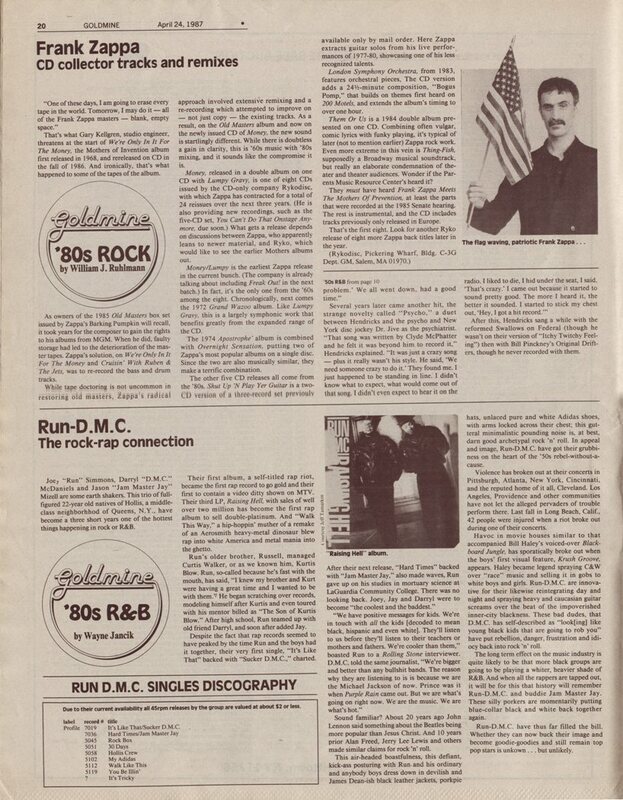 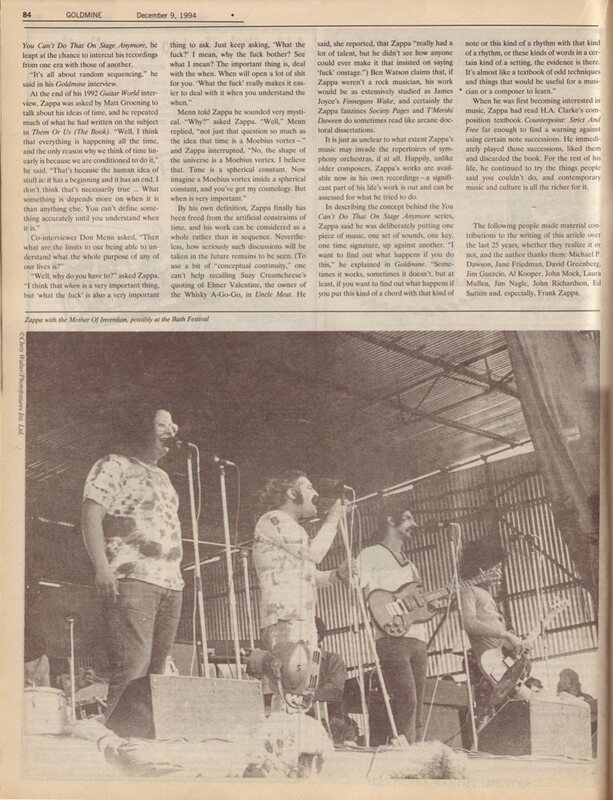 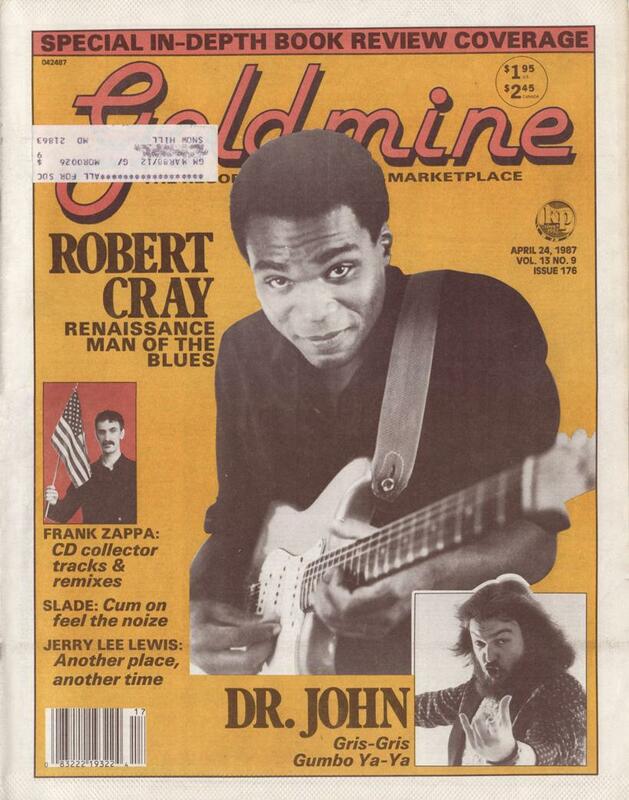 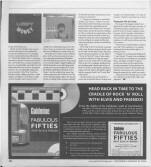 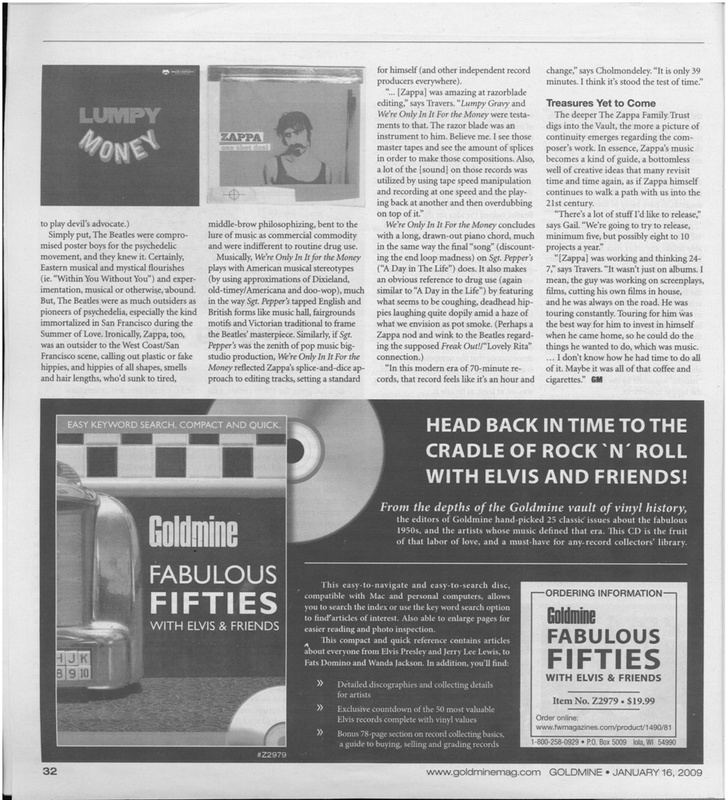 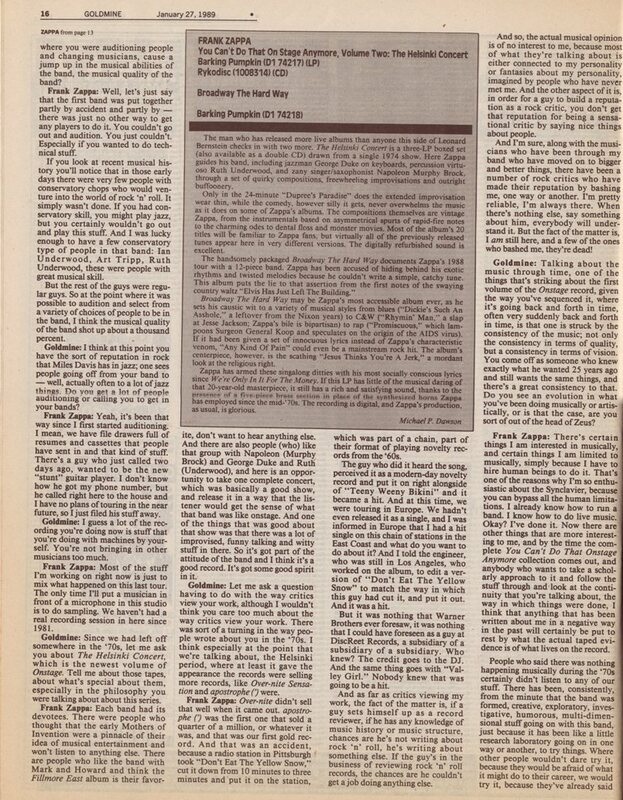 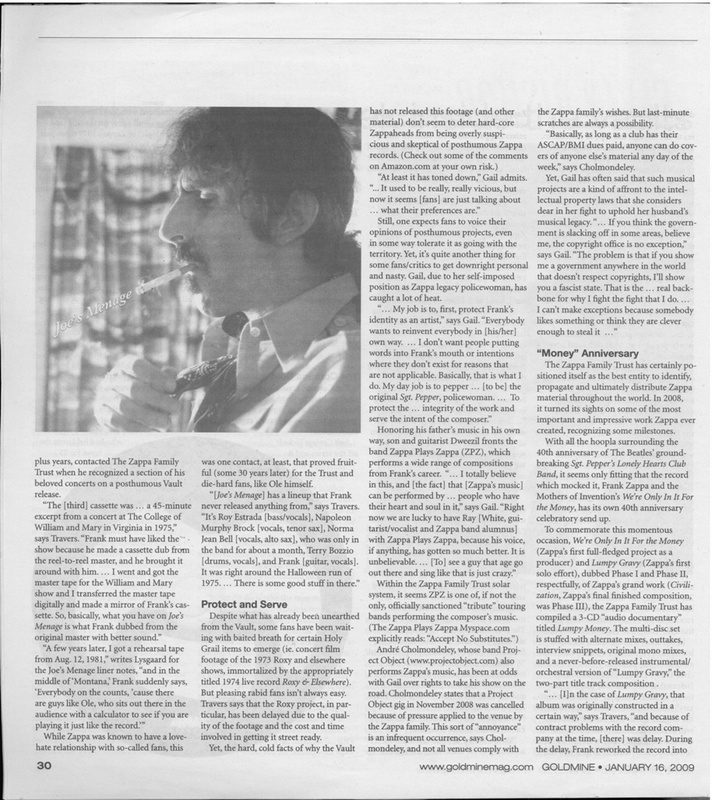 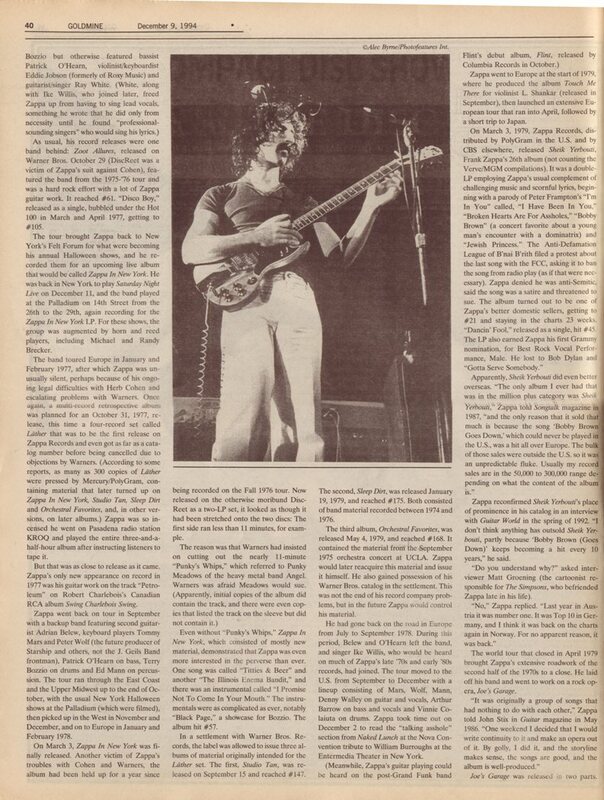 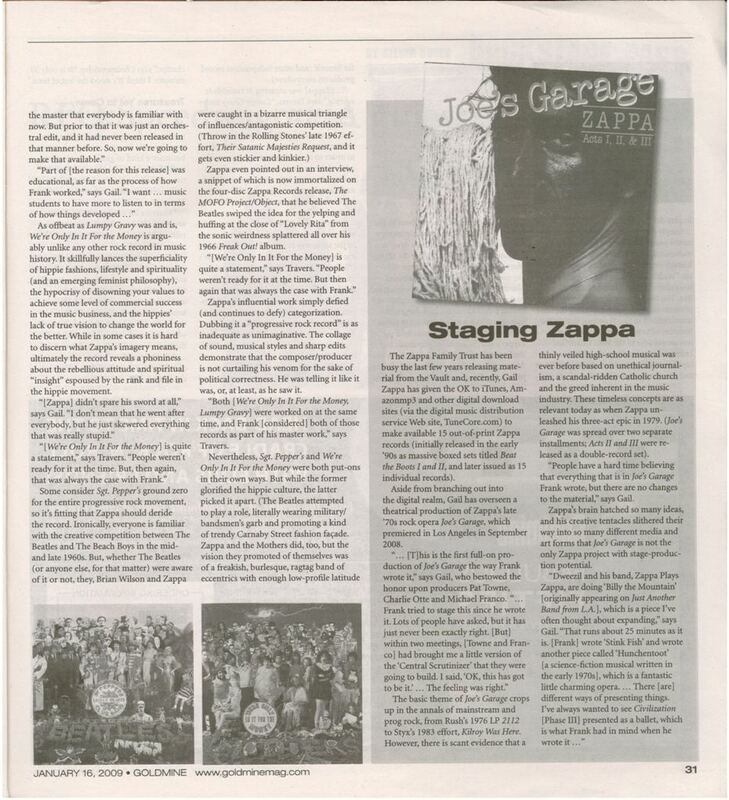 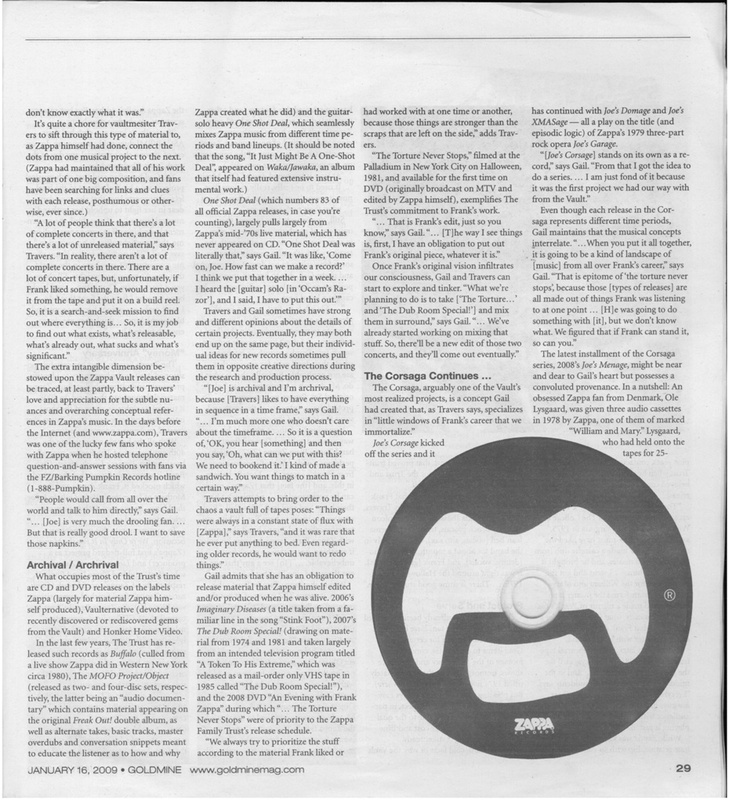 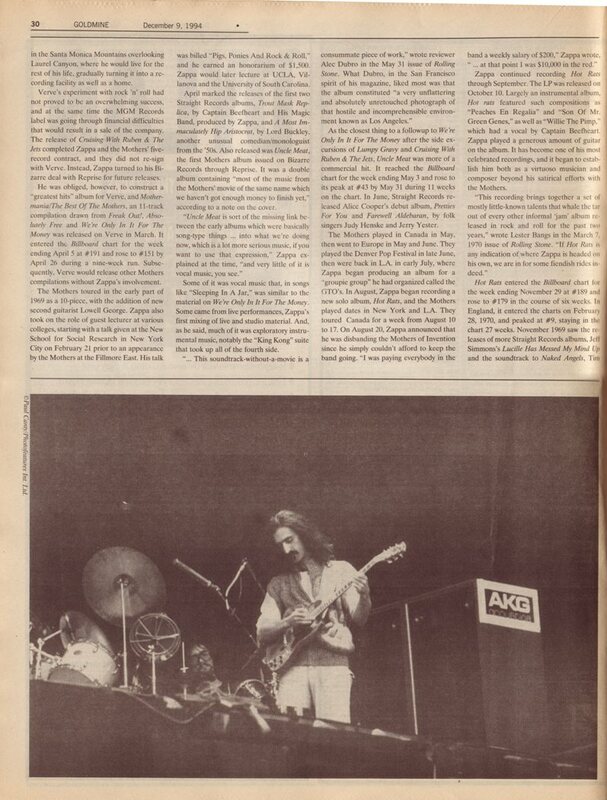 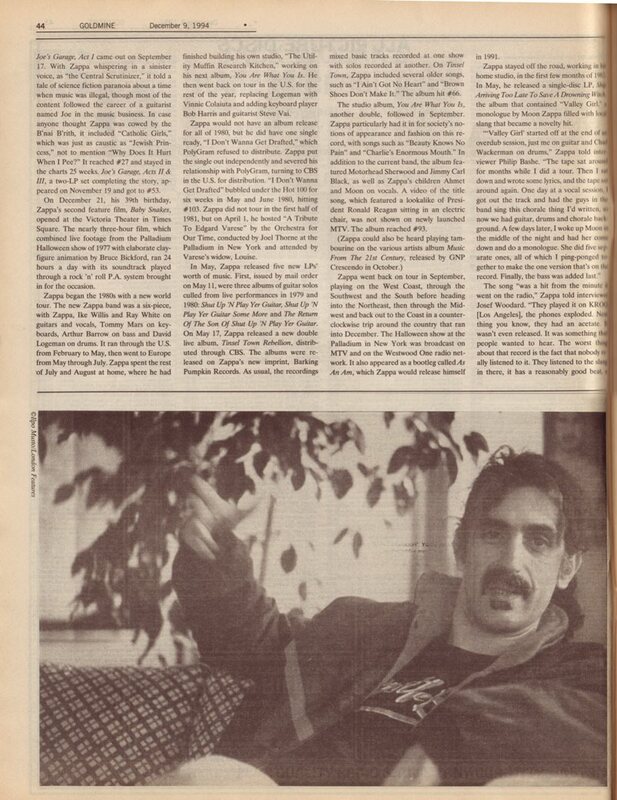 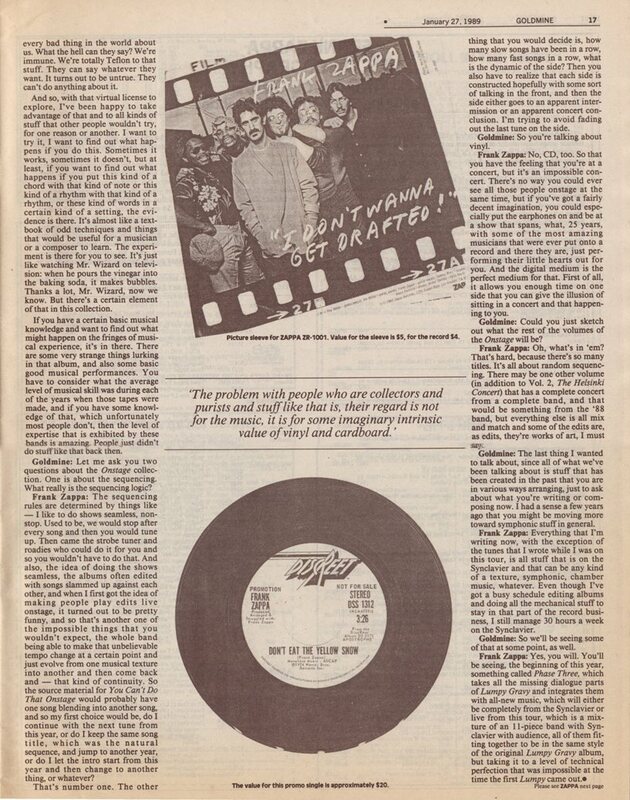 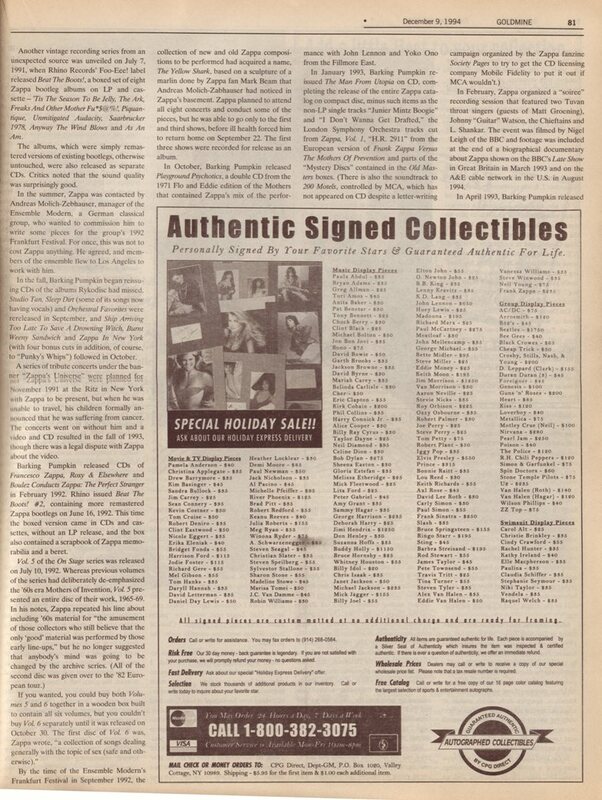 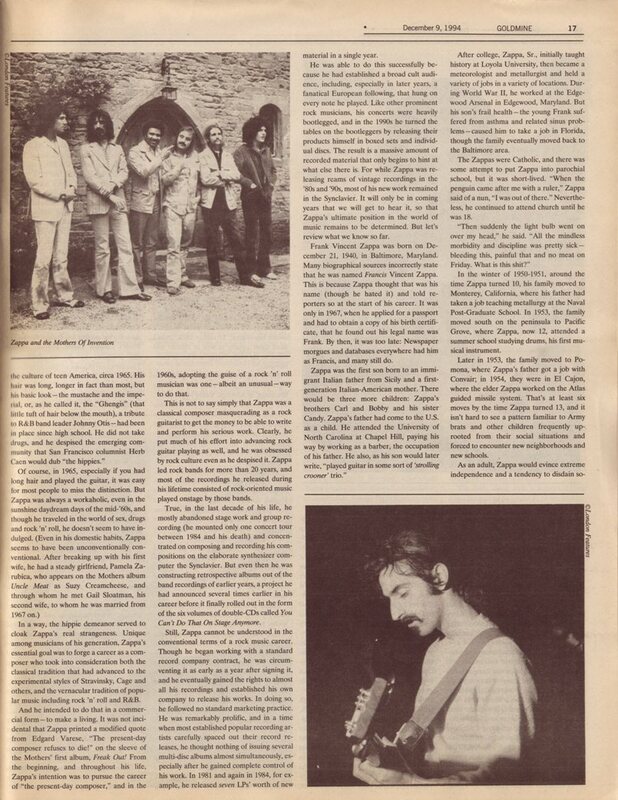 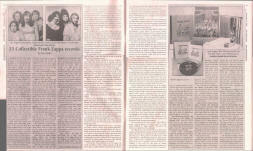 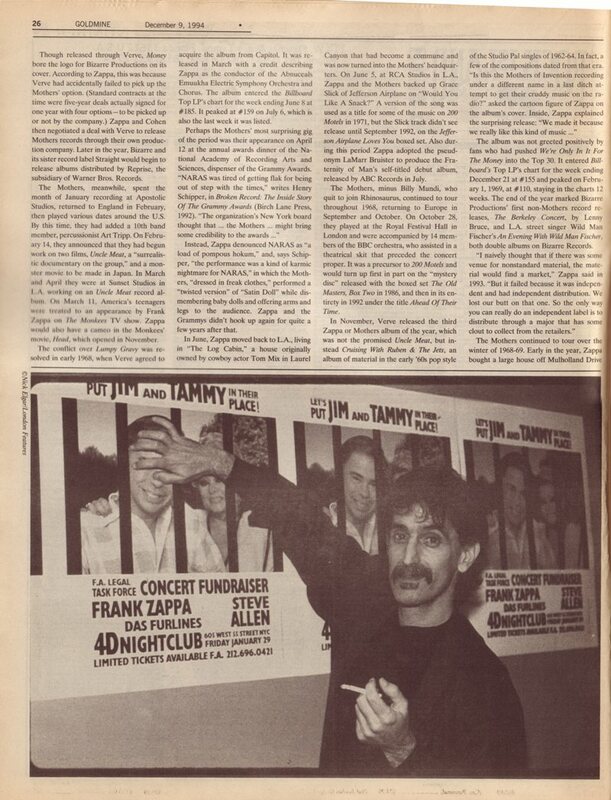 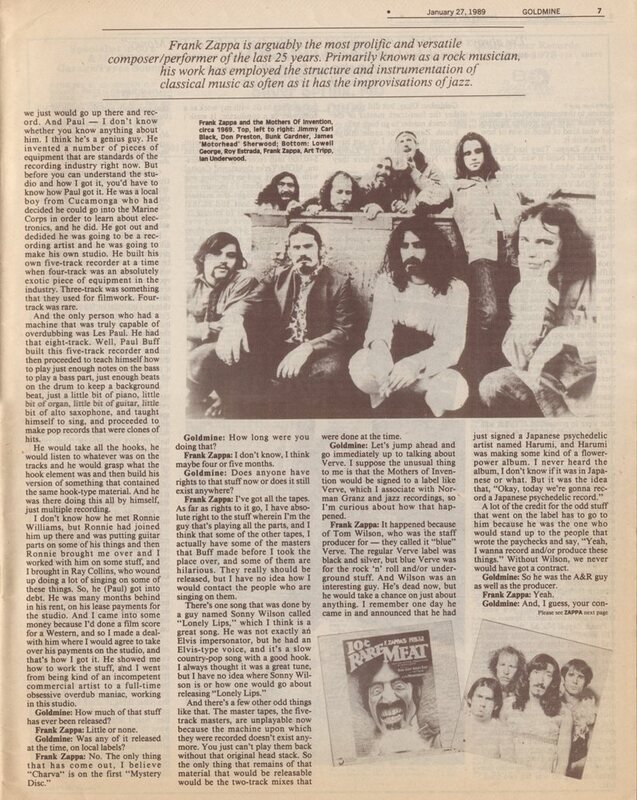 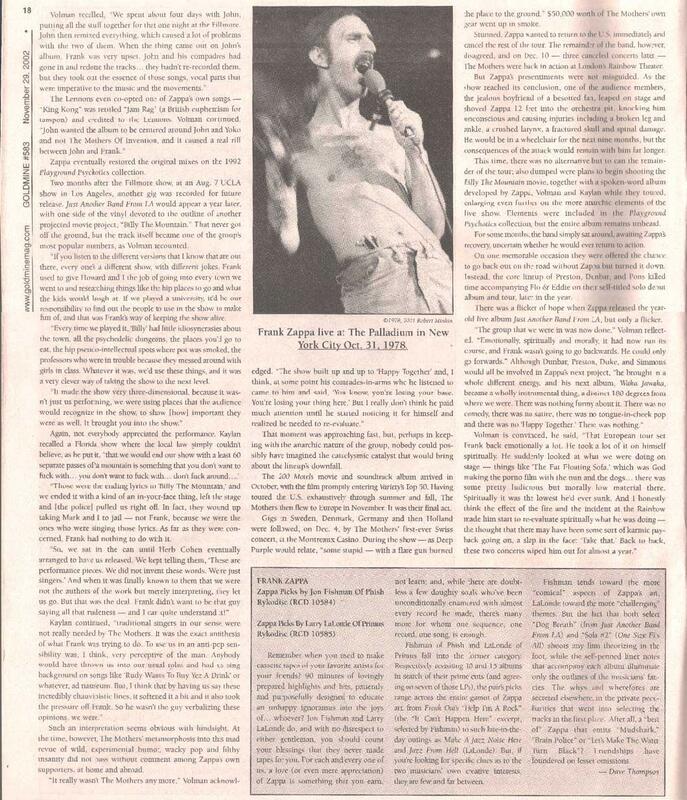 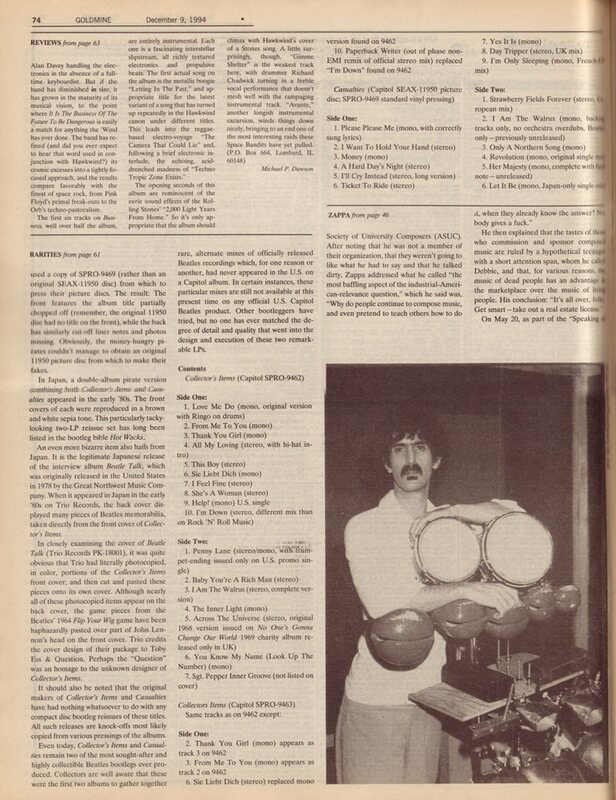 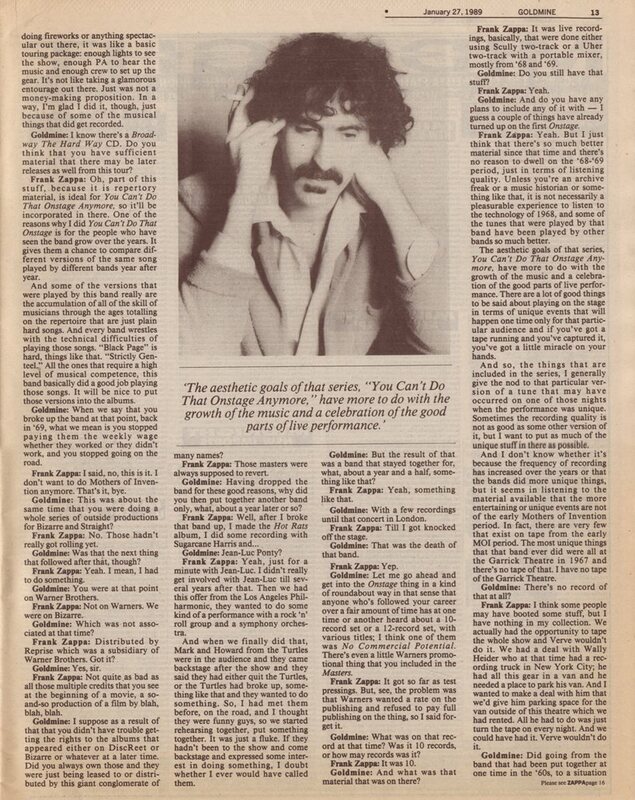 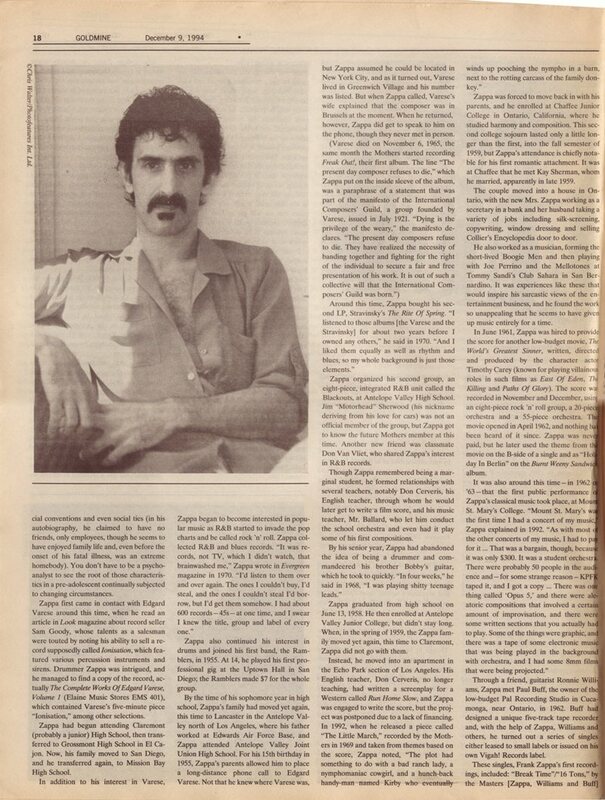 Another version of this interview was published in Relix, April 1989. 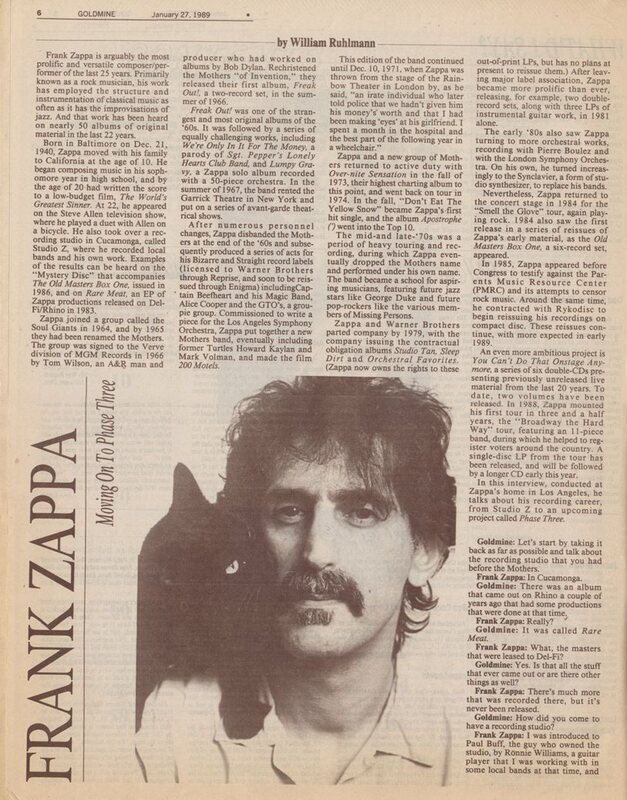 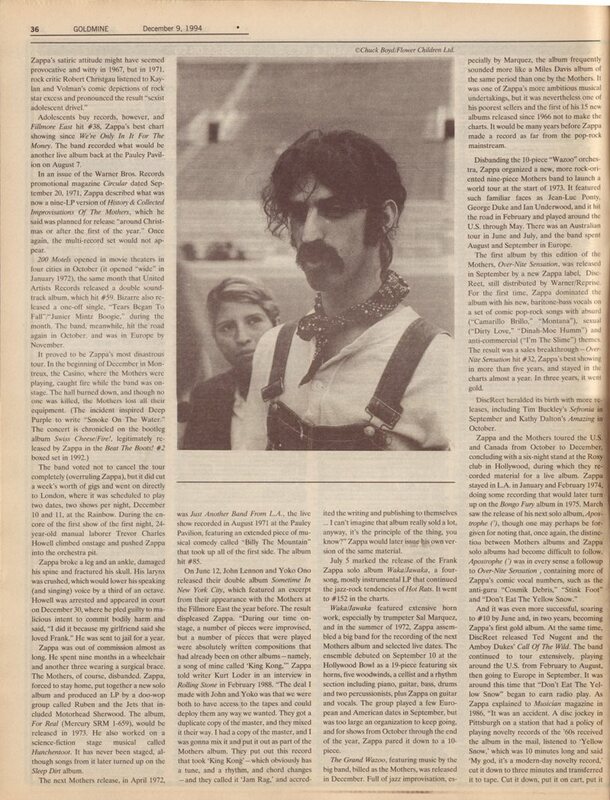 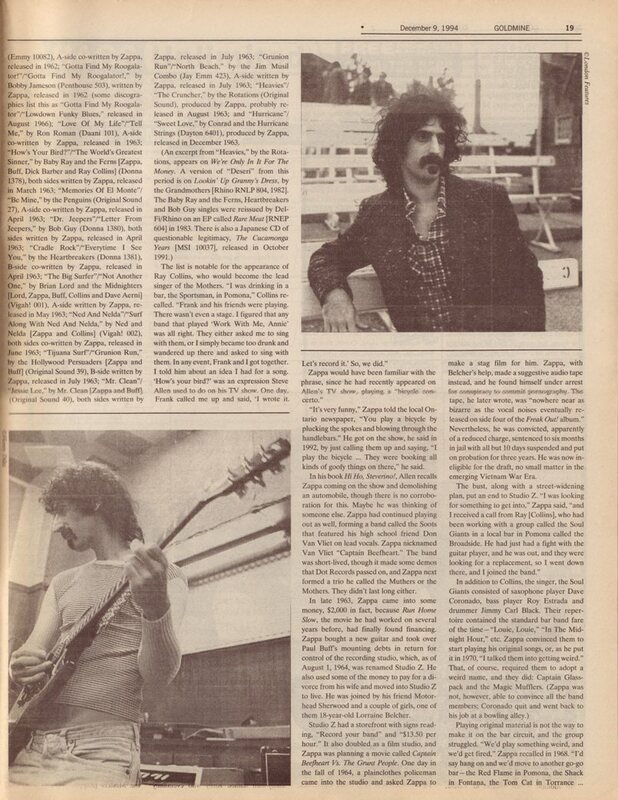 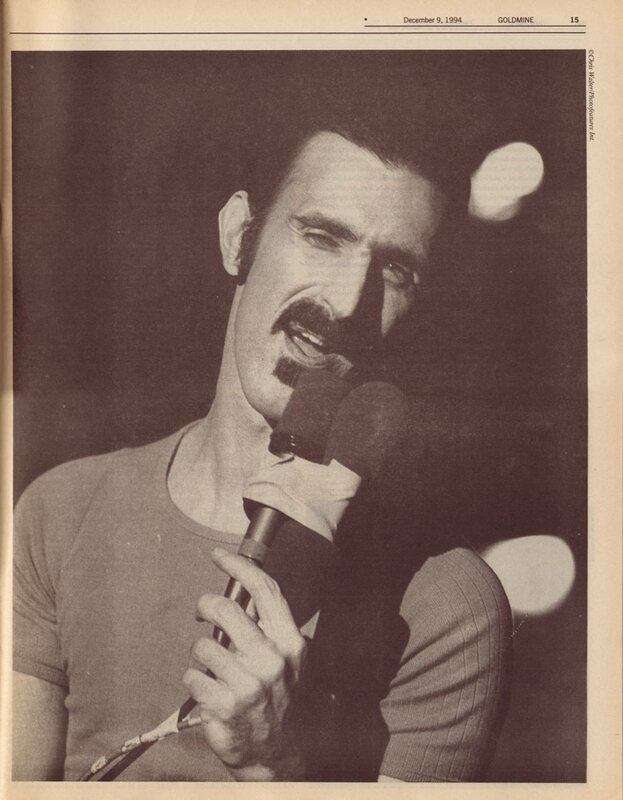 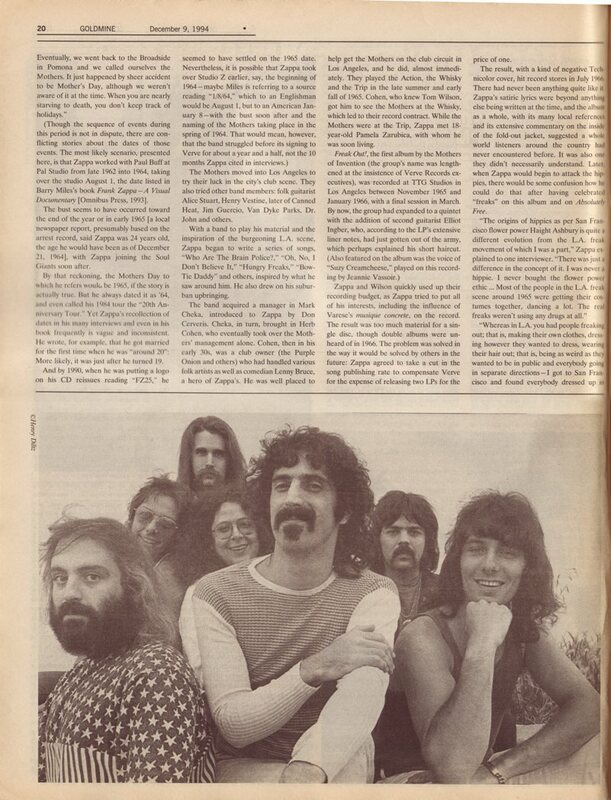 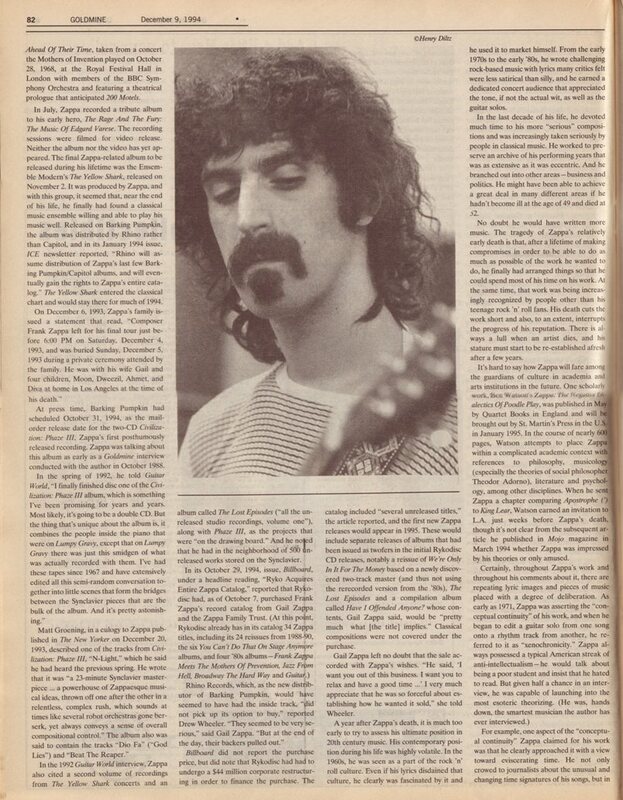 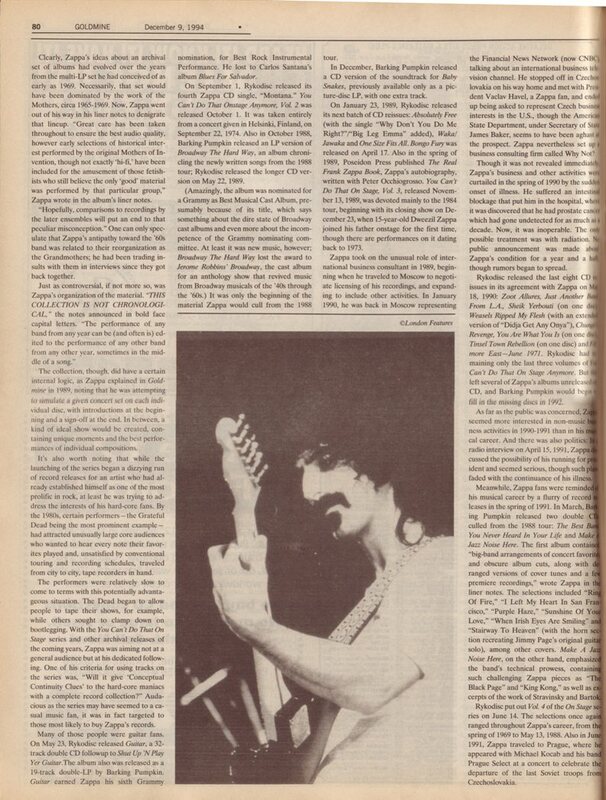 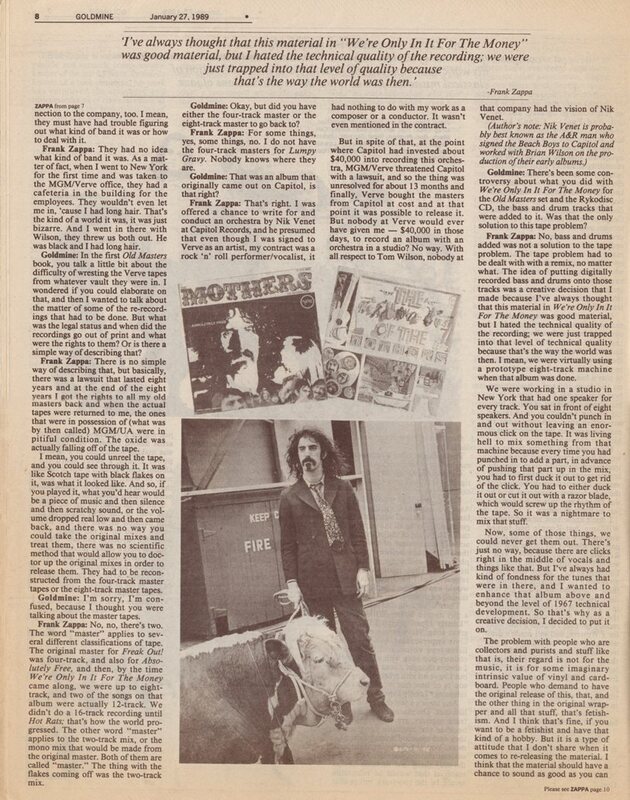 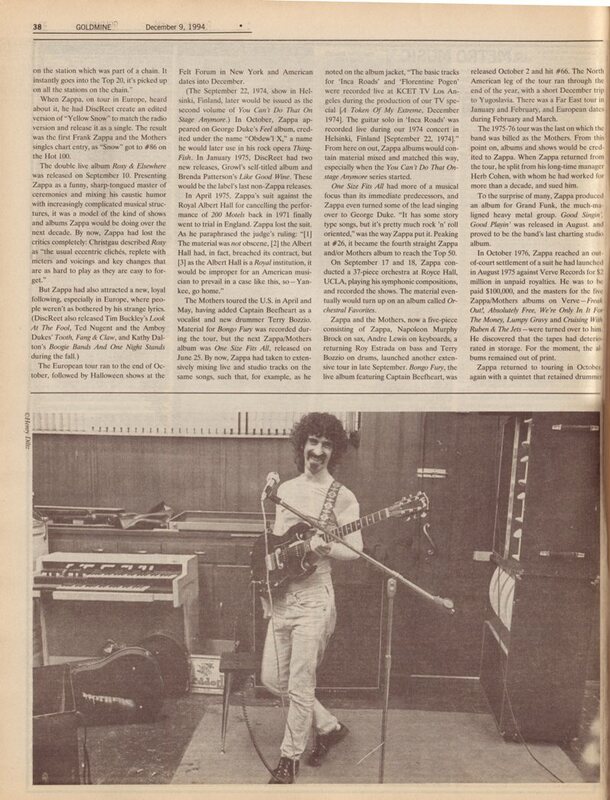 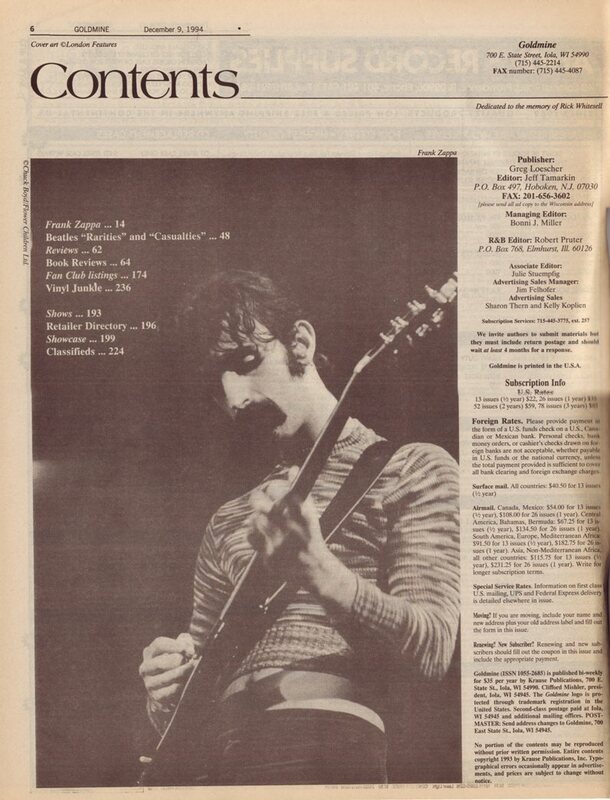 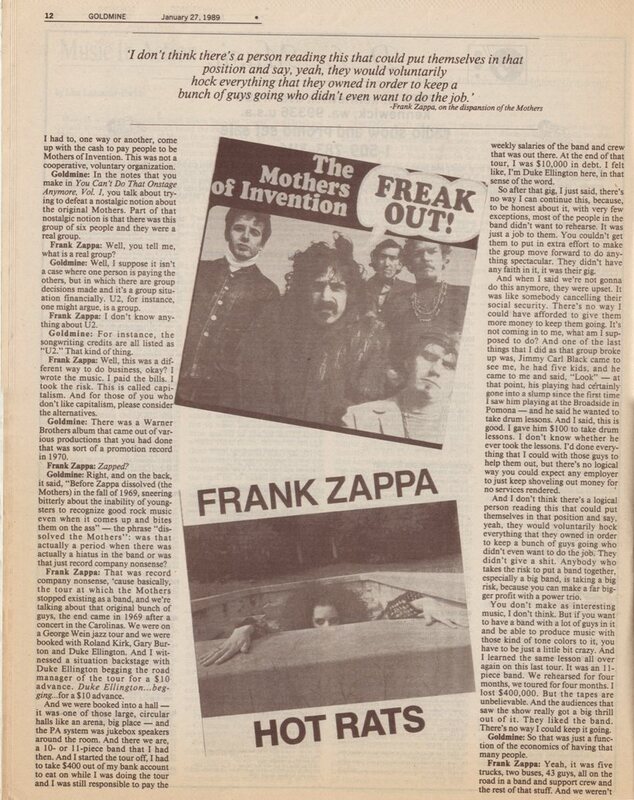 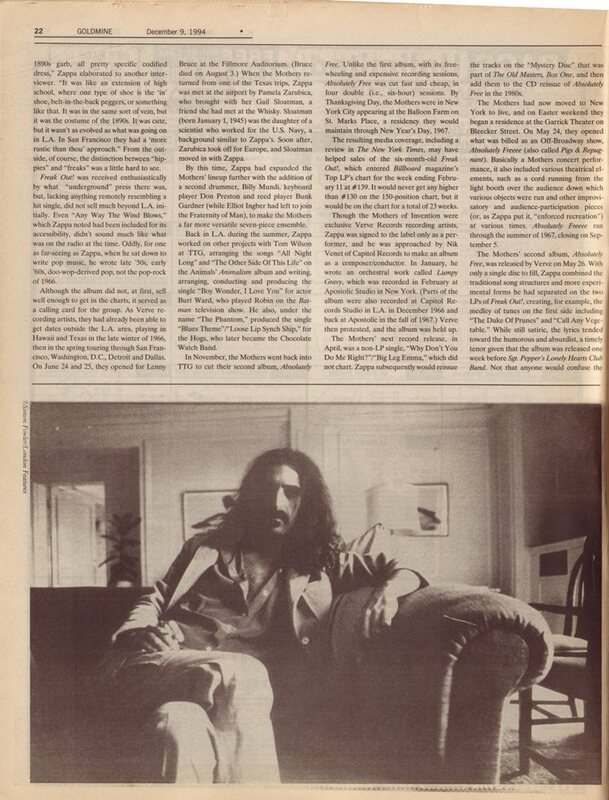 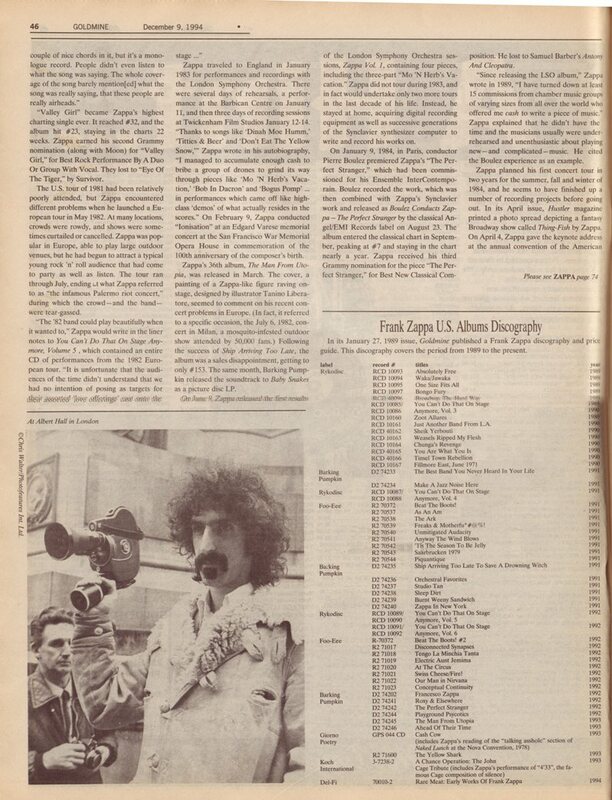 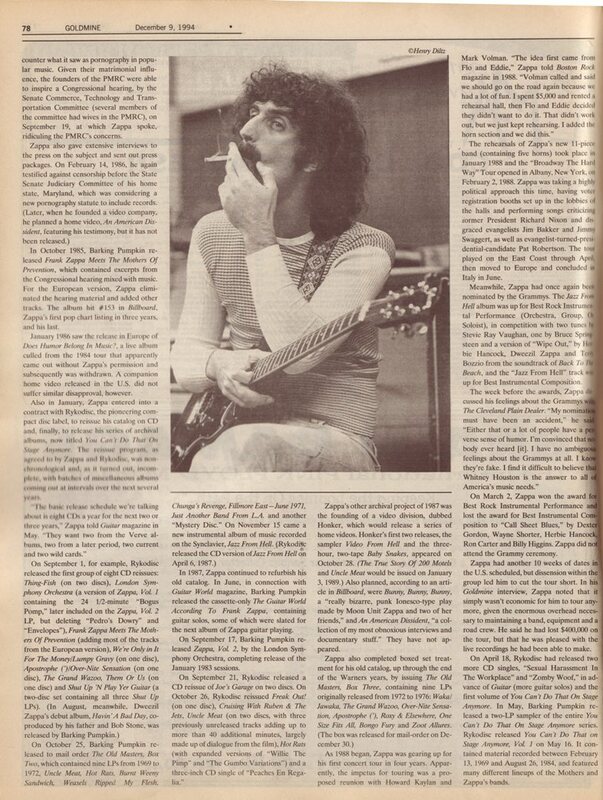 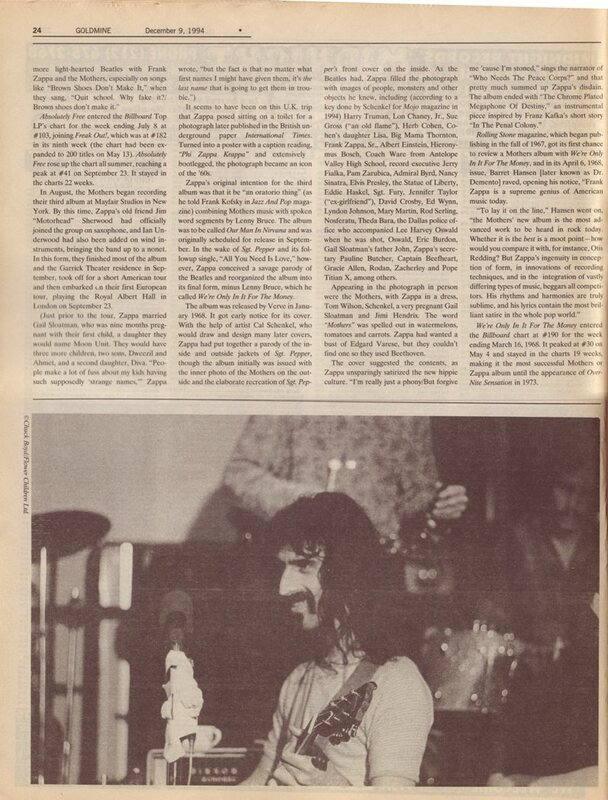 Between mid-1970 and the end of 1971, Frank Zappa was at his peak as rock's premier satirist and spokesman, an 18-month period during which he released three albums and one movie that laid the foundation for the reputation that would pursue him for the remainder of his life. 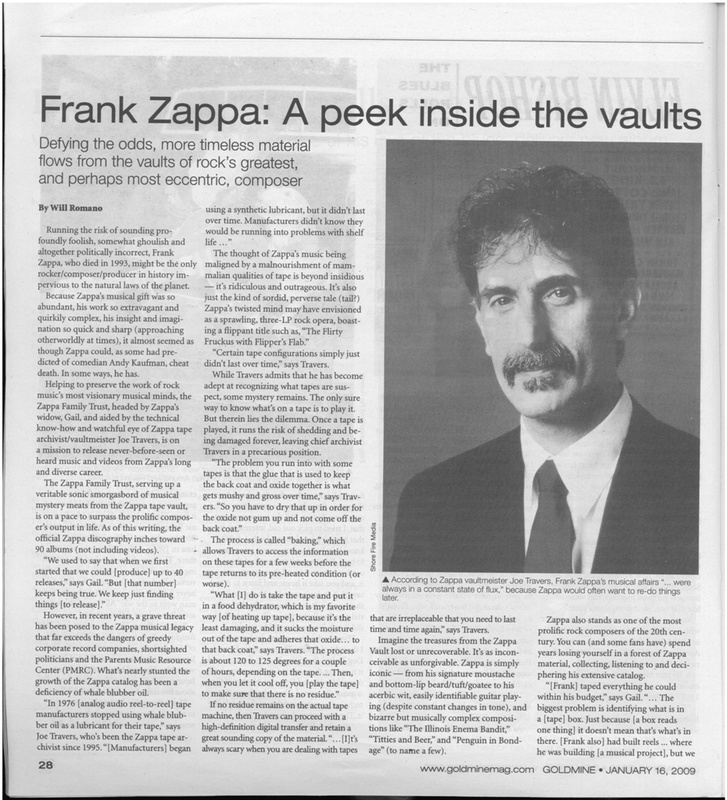 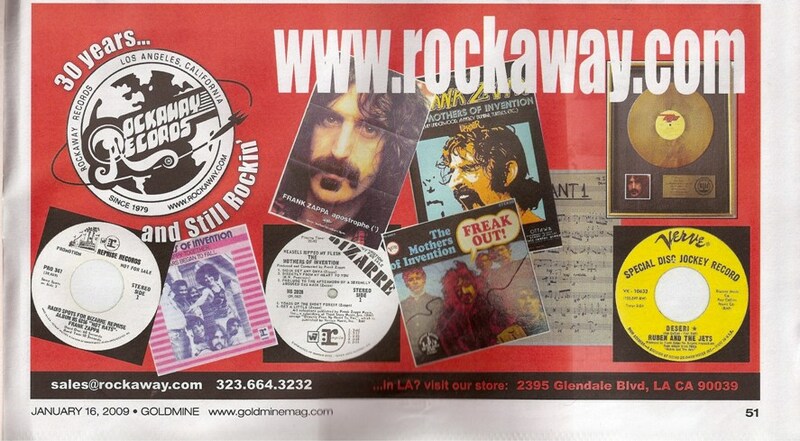 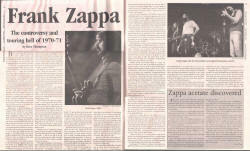 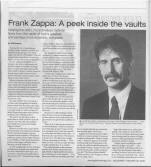 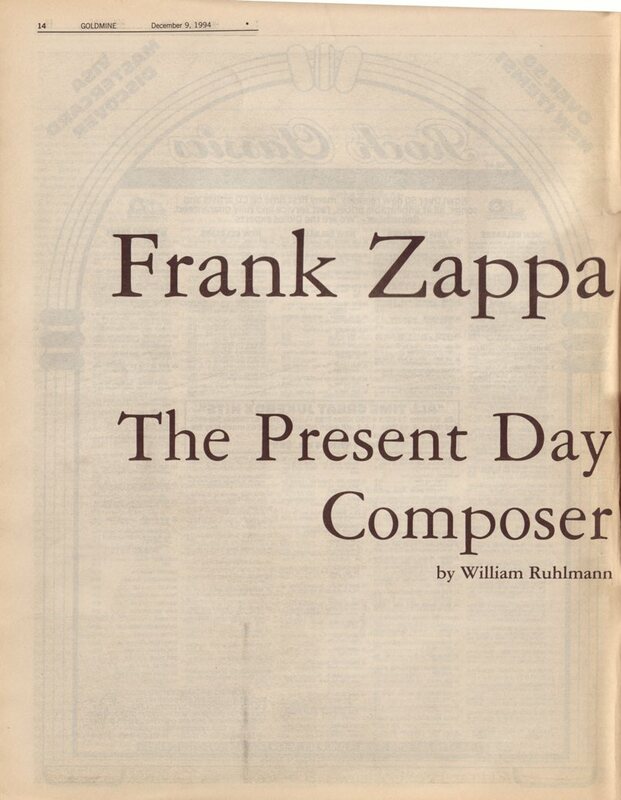 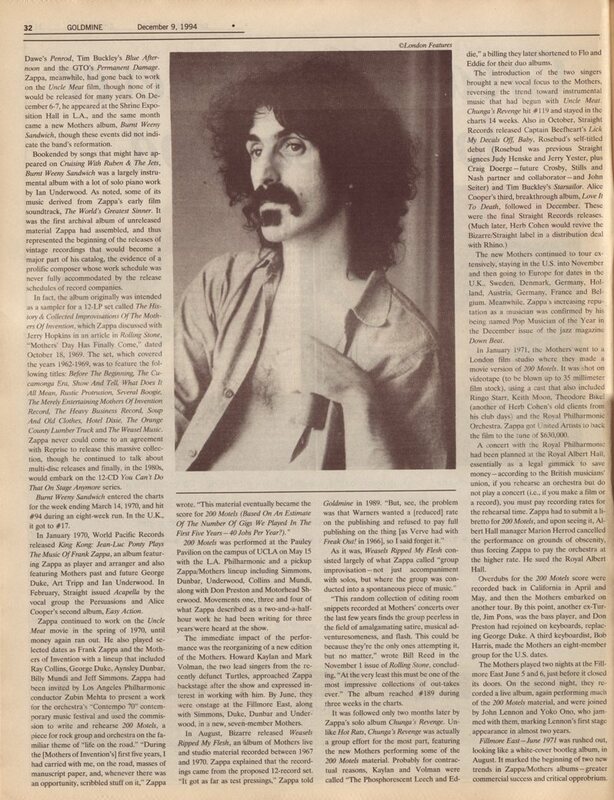 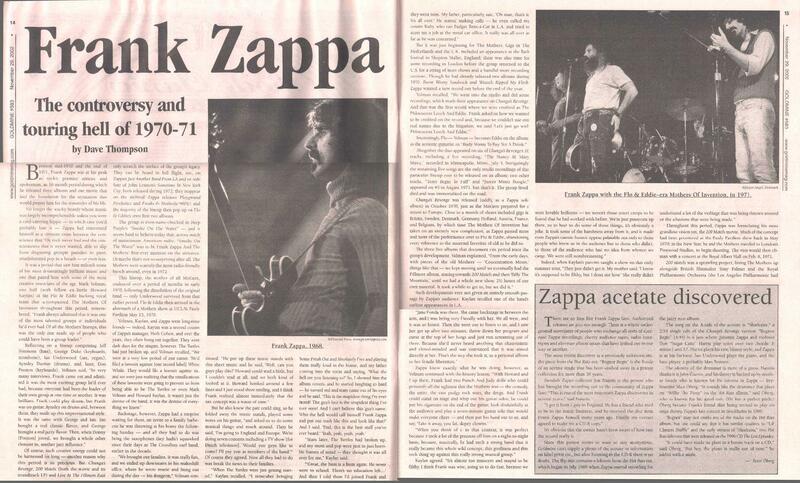 No longer the wacky beardy whose music was largely incomprehensible unless you were a card-carrying hippie – in which case you'd probably hate it – Zappa had reinvented himself as a virtuoso cross between the conscience that '70s rock never had and the consciousness that it never wanted, able to slip from disgusting groupie parodies to pure, unadulterated pop in a breath – or even less.